international montessori school, montessori academy, montessori curriculum, montessori education, montessori preschool, montessori school, montessori school near me, what are montessori schools? Millions of kids have experienced the thrill of a Montessori school over the last century, and if you’re interested in a Montessori school there’s a good chance that it’s because you attended one yourself. But as popular as this method is, it’s possible that you don’t know much about the woman who started it. Maria Tecla Artemesia Montessori was born in Italy in 1870. She studied many subjects while in primary and secondary school and excelled in the sciences and mathematics. Both of these fields of study were not common for women at the time, but that didn’t dissuade her from continuing her education. At first Montessori thought she thought she’d go into engineering, an odd choice for a woman at the time even though she had a degree in physics and mathematics. Instead, she chose an even less likely path when she decided that being a physician was the way to go. She applied to the University of Rome but was constantly discouraged from entering the field of medicine. Undeterred, she set out on the path by studying botany, anatomy, chemistry, physics, and zoology. After this undergraduate program, she was accepted into the medical program in 1893. As you might be able to tell, Maria Montessori was a determined person. She certainly needed it considering the harassment she encountered when she joined the medical department at the University, as most men at the time didn’t think women belonged in the field. In fact, she even had to do her cadaver dissections alone because it was deemed inappropriate for her to be in the same room as her fellow male students and that of the naked dead body! In her last two years at the university, Montessori became a medical assistant at a local hospital. It was during this time that she decided that she wanted to focus on psychiatry and pediatrics. The confluence of these two specialties certainly set the stage for what she’d become known for in her career. In 1896 Montessori officially became a doctor of medicine. She was also establishing herself as an expert in pediatric medicine and started her own private practice. As a pediatric physician, it was obvious to Montessori and her patients how much she loved working with children. But she was also interested in those that many in society ignored, such as children with mental disabilities. She thoroughly studied all of the existing literature on the subject, and was publishing often on the subject of children with mental problems. She visited many asylums, studying the methods of dealing with the children and taking that information on speaking tours. Soon she was so well known and considered such an expert that she was named as co-director of a new school with the goal of instructing teachers who worked with mentally disabled children. This school was also an educational laboratory where these teachers, including Montessori, could study the children and try new methods and learning materials out on them. Thanks to this new form of pedagogy, some mentally disabled children who were once labeled as unteachable were able to pass standard tests that were used in regular classrooms. Montessori left the school and took additional psychology courses, all the while working with children of all mental capacities. The methods that she had helped develop at the school for the mentally disabled had worked so well that she wondered if they would be just as effective in a traditional classroom. Already an expert on education, she continued to publish papers about the most efficient ways that children learn. The Casa dei Bambini, or Children’s House, was opened in 1906 and was Montessori’s first chance to try out her teaching methods on a large group of children. A group of 50 children from a low-income housing project were the first to experience these new methods. While Montessori didn’t teach them herself, it was her methods that were used. But giving the actual teaching duties to someone else, she was freer to observe and study the way the children learned. She found that interactions with the environment, including seemingly mundane tasks such as cleaning the room or tending to the garden, interested the children as much as the toys and gave them great purpose. Noticing this interest, Montessori expanded the list of tasks that the children would be allowed to do. This included care for plants and animals, gymnastics, and cooking. She also brought in smaller, lighter furniture that the children could move in order to take full advantage of the space around them. There were also more opportunities for each child to make their own decision in the learning process, working independently and uninterrupted. While it was certainly counterintuitive to many teachers, Montessori was discovering that a teacher in the classroom should be as an observer and director of the activities, not simply the one who was explaining how to do something. Within three years there were five schools based on the methods of Montessori. By 1912 there were Montessori schools in Switzerland, Italy, the United Kingdom, and France, and dozens of other countries soon followed as her work was translated. The first Montessori school in America was in Sleepy Hollow, NY, and within two years of its opening, there were more than 100 such schools in America. Montessori’s book The Montessori Method: Scientific Pedagogy as Applied to Child Education in the Children’s Houses was a bestseller, and in 1913 she toured the United States giving lectures. Unfortunately, the first Montessori rage in the United States was short lived. A book critical of the method did great harm to her ideas, and the methods quickly fell out of favor by 1915. While Montessori herself returned to Europe and lectured throughout the world until her death in 1952, the United States largely rejected her ideas until the late 1950s. Adherents of the method who had studied in Europe once again brought Montessori to America, and from there it has shown no signs of stopping. Today there are more than 4,000 Montessori schools in our country. 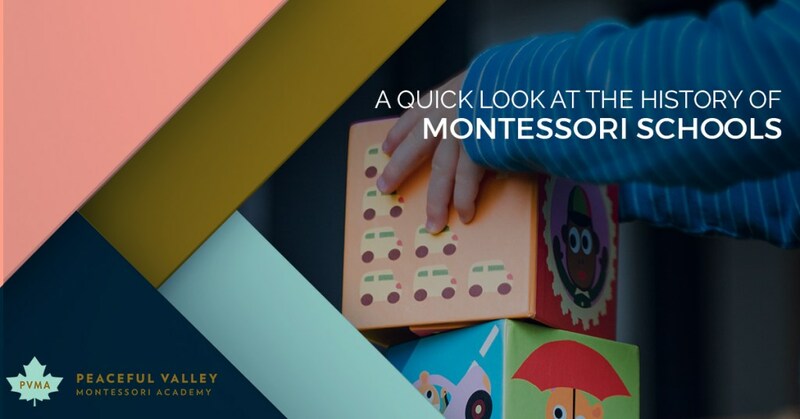 Here at Peaceful Valley, we’ve taken the best parts of Montessori’s methods and combined them with the many improvements that have been found over the last century. If you’d like to learn more, we’d love to talk with you. Contact us today!